Gouges and pallets are made from the same hard brass as our handtools and are cut from 5mm thick sheet. 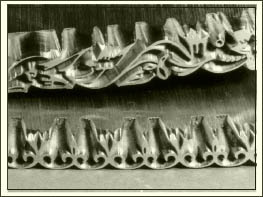 The gouges are then formed to the required curves before machining, this produces better sighting than traditional cast gouges. Pallets are finished flat on the sighting side with a long bevel on the reverse. They are supplied with a 9 inch arc as standard, but can be made flat if required. Pallets come in sets of 10, either single line, double line or thick and thin line. 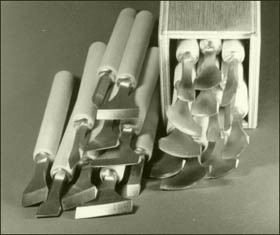 Gouges are sold as a set of 12, a set of 5 semi-circle, or 4 circle gouges. For more aesthetic tooling our set of 40 designer gouges and 7 blending gouges are ideal - these are also available as a half set of 20 or they may be supplied individually (as can all tools). Unless otherwise requested all single line pallets and gouges are made with a 1.5 point (.020 inch / .5mm) line thickness. Double and thick and thin line are as shown on the following page and come with mitred ends. A starter set of gouges and pallets along with some simple handtools are available in the popular amateur sets (opposite page). Gouges, like our handtools are now made with a slightly domed face. All sets are supplied in strong wooden boxes.